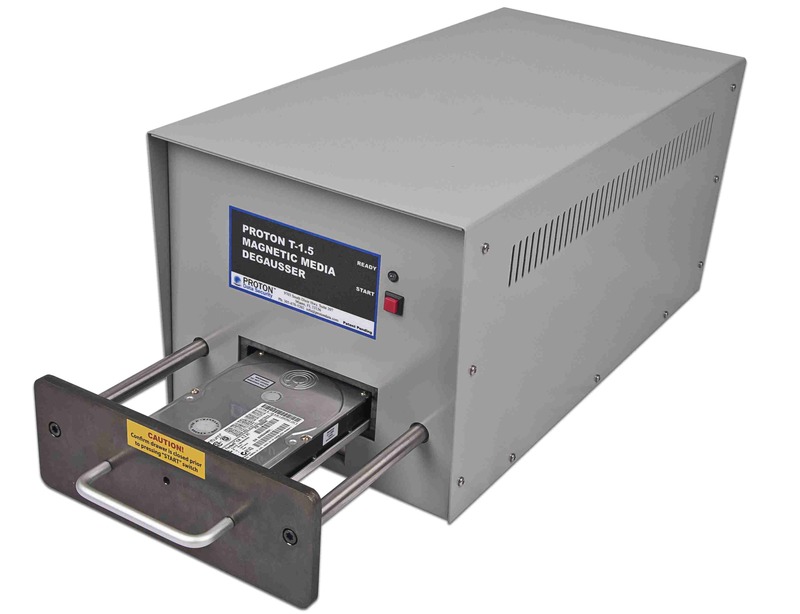 The Proton T-1.5 is a drawer style degausser that permanently erases data from hard drives and various tape media. It has an effective magnetic field of 1.5 Tesla, making it capable of sanitizing the highest coercivity media available today and it will continue to keep pace as hard drives technology advances. The Proton T-1.5 helps organizations protect their sensitive information and stay in compliance with recognized data security standards and regulations. It is the ultimate guard against data loss, which can lead to costly data breaches. 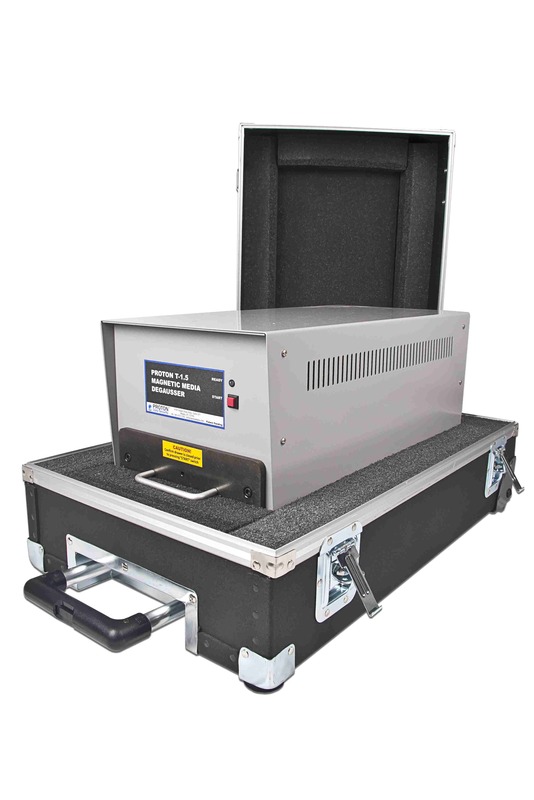 The T-1.5 is fully automatic and has a cycle time of less than 5 seconds, making it the fastest electro-magnetic pulse degausser available. Operation is easy - simply insert the media into the drawer and push the start button. Internal software acts as a built in safeguard and assures the unit is operating at peak performance for each cycle. The T-1.5 is extremely compact and portable, which allows it to fit easily into existing operations and be transported when necessary. Destruction of confidential, sensitive and classified data in accordance with National Institute of Standards and Technology (NIST). Internal software requires all parameters (capacitor voltage, switch, etc.) are present prior to the "GO" LED display. If any problem exists that will compromise degaussing, the "GO" LED will not display. This software guarantees that each degauss cycle delivers sufficient strength and consistent performance. Will erase any magnetic media that fits into the drawer: Including all standard hard drives (laptop, desktop and network storage tapes (DLT, LTO, DDS/DAT, etc.). Optional deployment case with wheels. Manufactured in the USA in ISO9001 certified facilities. CE Certified and ships with CE mark. Send mail to sales@bowindustries.com with questions or comments about this web site.